Dr Renee consulted by Guardian on safety of aesthetics clinics. As aesthetic procedures become more desirable, it seems that people are willing to sacrifice their health and safety to save a few bucks. 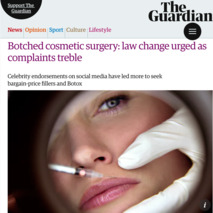 Dr Renee discusses with Sarah Marsh from the Guardian, the increased number of patients she is seeing who have had lip fillers done by unqualified, unregulated and untrained practitioners. These practitioners are often beauticians at best, or the girl next door at worst. The procedures are often carried out in kitchens, living rooms or generally unsuitable premises and the result is an increase of post procedure problems. Dr Renee is seeing more patients with fillers placed too superficially causing lumps and nodules, placed outside the lining of the lips causing distortion and the wrong type of filler in the wrong place. She also finds that patients are not properly or clearly consented and so have no idea of the risks and benefits of the procedure they are undergoing. She says " Its really sad. These women think they are saving money on what is essentially a medical procedure. Unfortunately they end up with problems that then take more time, often more money and worse, a stigmatising problem on their faces. The industry needs regulation with only qualified and reglulated practioners being permitted to carry out these often complex procedures which are simple in the right hands. I urge patients to think abiout their health and not look for a cheap solution that is often more expensive in the long run. I go on at least 10 courses a year even though I am an experienced practitioner who is fully trained. Why? Because it is essential to keep my skills up to date, share techniques and see what the latest research and complication handling is. These unqualified practtioners will be unable to attend courses because they do not meet the basic requirements and so are operating completely off radar and with no training". "Don't gamble with something so important: your face is one of your most valuable assets".